Previously, you may have seen my blog posts using the Rust-Oleum Countertop Transformations Kit in our master bathroom. This time around, it was our garage floor that needed help. I told my husband I had seen kits at Sam's Club about 2 weeks previously. We searched the store, and they were down to one (1) kit left. It wasn't in a box, was the Rust-Oleum Professional Floor Coating Kit - only in a black, 5 gallon bucket. It said it covered a 2 1/2 stall garage and the price was right so we purchased it. However, looking closely at the square footage, we felt we were going to need a second kit. No worries, we saw the same product at Home Depot on a previous trip. Off my husband went to purchase a second kit in the matching color. Home Depot scored us a second kit in a matching shade and we were set. Something I want to make clear to anyone researching this product is there is a big difference between the Professional version and the standard version sold at Home Depot (Rust-Oleum Garage Floor Kit ). I haven't seen this mentioned in any of the reviews or in the research we did on the product before purchasing. More on that in a minute. One of the most important steps is the prep work. We cleaned out the garage completely, swept, used a leaf blower and then washed. We then used the citric acid cleaning crystals that come with the kit and scrubbed oil spots with a scrub brush and then washed again. After 24 hours drying time we set to work. The instructions on both kits say if you are using more than 1 gallon base, to mix the bases together first to get a uniform color shade, then pour back into their respective containers. We did this with both kits as the bases were exactly the same. You mix part A with part B just before applying. The Professional version was used first. Mixing A with B, you then wait a certain amount of time (about 15-45 minutes) depending on the temperature and humidity of the day. 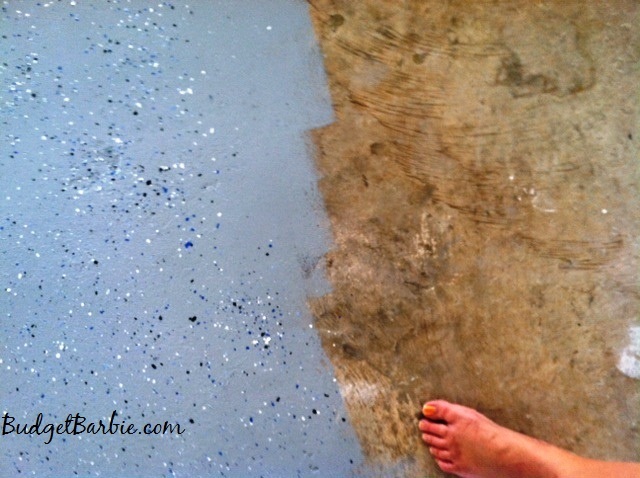 We found it to be quick and easy with me 'cutting in' the edges (painting the edges) with a brush and then my husband filling in the center with a roller on an extender, while I stood by with the speckle chips to sprinkle as we did about a 4X6' area at a time. You have to work relatively quick as the mixture starts to thicken at about 1 hour and soon it turns to soup, then to something resembling Elmer's glue and finally, a thick, gooey mess. We timed it perfectly and finished the mixture and then mixed up the 2nd kit we purchased from Home Depot. The 2nd kit was the same texture and color upon mixing and pouring into the paint tray. It looked like an exact match. We continued to apply the second kit on the other half of the garage as we did the first, however we almost immediately noticed a difference in product. Same product, same name, same color... but the kit purchased at Sam's Club labeled "professional" was much better quality. The standard kit got to the thick, potato soup stage within about 15 minutes, making application more difficult. As we sped up the process for the last part of the garage it quickly went to the glue stage and started to leave gooey bits in the finish in which we had to physically pull out of the finish. They were like giant monster sized boogers. Towards the end we were racing to get the product on before it got too thick to utilize. Had it been me or my husband working alone, this would have been an issue. As it was, we finished the job and stood back to inspect. We could definitely tell a slight shade difference between the two kits even though we had mixed their bases together at the start to ensure a uniform color. We hoped it was because the first part was drying already and the second was newly applied, but about 6 hours later we had to admit; there is absolutely a slight color difference in the professional kit sold at Sam's in the black, 5 gallon bucket verses the kit sold at Home Depot in a box. If you are buying two kits, be sure to purchase both kits of one version. Instructions say you need to let it dry for 16 hours before walking on it and 3 days before driving or parking on it. After 24 hours the professional kit side of the garage may have been able to be walked on, however the Rust-oleum kit from Home Depot was sticky. So sticky that we found 2 or 3 little bugs that had wandered in during the night (we left the garage door up about 2 inches so it didn't touch the surface and mar the smooth texture) and the critters were caught in the sticky finish. At the 2 day mark the professional side is dry and really, quite beautiful and looks to be durable. The standard kit is still tacky. No where near being able to be walked on even at 2 days. The instructions say after day 3 you can drive on it but that would be tomorrow and there is no way anyone or anything is going to walk on that side of the garage. Still sticky and tacky we are guessing it's going to be about a 5-6 day drying time. In the end I highly recommend the Rust-oleum Professional Finish kit. Easy to apply, fun to do, dries fairly quickly to a tough, durable surface and looks great. 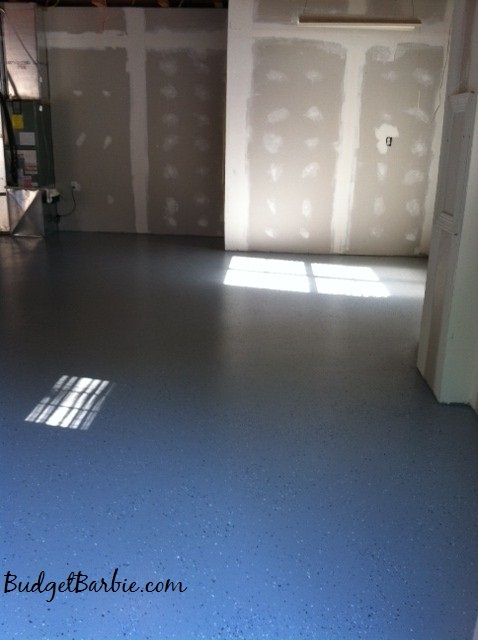 I personally won't use the standard kit again, But we've already said if we ever move to a new house we absolutely will do our garage floors again! We will use the professional version. The chemical compounds used seem to be higher and better quality with a faster drying time.